Greetings again from Media4Kids International! We hope and pray that you are well and are enjoying this beautiful summer. 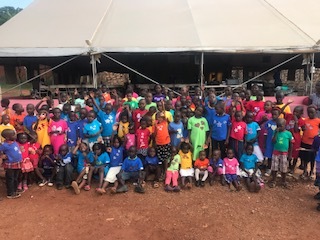 M4KI had the privilege of attending the Christian Alliance for Orphan Summit (CAFO) this year, along with more than 180 organizations and a wide network of churches that unite together on behalf of orphans, foster care and adoption. At CAFO we were able to make more connections with amazing people that work with vulnerable children and families. Since one of our goals is to provide faith-building media to help prepare vulnerable children for their future, a number of these organizations requested, and we will be providing them each with, a full M4KI library. This quarter we sent out M4KI Libraries to: – Neighborhood Kidz Club in Katy, Texas; Hope’s Closet in Hamilton Ohio; Cambia tu Mundo in Nuevo Leon, Mexico; Buckner International in Dallas, Texas; and Florida Baptist Children’s Homes in Miami, Florida. M4KI is presently having the “Never Alone: God’s Promises Just for You” booklet produced. It is an illustrated collection of some of God’s promises, specifically designed to bring hope, faith and peace to orphan and foster care children. Beautifully illustrated, we know this will encourage and uplift these young ones who have already suffered so much in their young lives. We appreciate your prayers for the completion of this important project. Thank you for your continued prayers and support of M4KI. God bless you and continue to make you a blessing to many!